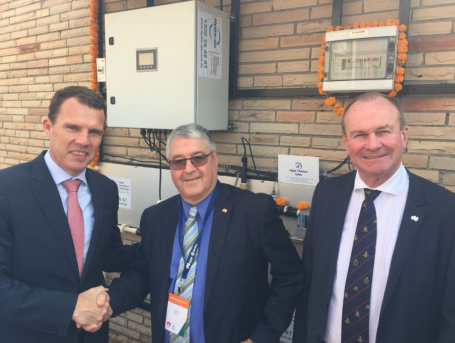 South Australian company and Water Industry Alliance member Hydro-dis has taken its revolutionary water treatment technology to India, thanks to introductions made during the 2017 State Government-led business mission to the country. Hydro-dis has visited India three times in the last year, securing a pilot site in Rajasthan through the Rajasthan Centre of Excellence in Water Resources Management – established by the South Australian and Rajasthan Governments to help facilitate the sharing of water management expertise. Hydro-dis is partnering with the Malaviya National Institute of Technology (MNIT) to install the pilot plant in one of the MNIT student accommodation buildings housing 400 students. The project will facilitate performance testing of the Hydro-dis System and enable student research using the Hydro-dis water treatment technology. The testing program has been designed to facilitate Indian certification of the Hydro-dis technology (similar to its Australian AS 4020 certification) so it can be installed throughout India. Australia's Deputy High Commissioner to India,Chris Elstoft, Hydro-disManagind Director Mark Carey and SA Investment and Trade Minister MartinHamilton-Smith.